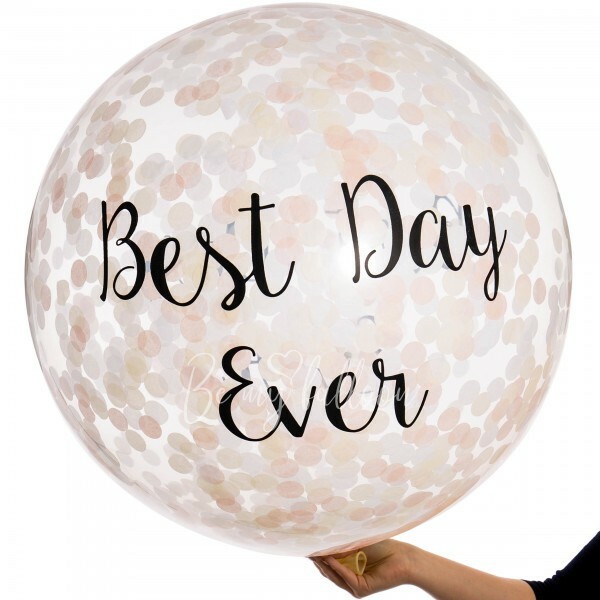 The stunning three foot Best Day Ever Elegance Giant Confetti Balloon is perfect for your wedding day! The clear giant balloon is filled with stylish white confetti, and printed with "Best Day Ever", perfect for celebrating the beginning of your new life together! Sure to create a wow factor on your big day, at the reception or at a bridal shower. These super balloon filled with gold confetti will be an essential addition to your decorations ! This super balloon filled with blue confetti would be ideal for adding an ultra original touch to all of your decorations! These super balloon filled with blue confetti would be ideal for a chic and original party! Big, Bold and Colourful! This stunning Mickey Mouse Circle Confetti Giant Balloon is sure to make a statement at any event. Bemyballoon.ae - the first online balloon store in Dubai, where you can easily order the balloons delivered for any occasion and for any amount. Balloons decoration creates a festive mood, gives pleasure to both adults and children! On our site contains a wide range of a different of balloons: plain latex balloons of different colors, foil balloons with a pattern for any occasion, unique sets of balloons, which will surely make the holiday memorable, arrangement of balloons, large balloons and much more. We offer a wide choice of high-quality balloons, convenient service and fair prices! Also we are engaged in a complex event decoration balloons. Arch and garlands on the front group, wedding decoration, colorful bouquets of balloons to the children's party, the unique arrangement of the balloons - all masterfully fulfill our experienced designers. Please fill in all the fields to leave a review. We really appreciate your opinion and take it into account.